Collings Interiors provides pre-cast fiberglass reinforced gypsum/concrete (GFRG/GFRC) products to replicate structures, such as columns and statues, which are usually composed of solid marble or any other high quality material that is both costly and cumbersome. These products are available for both interior and exterior uses. 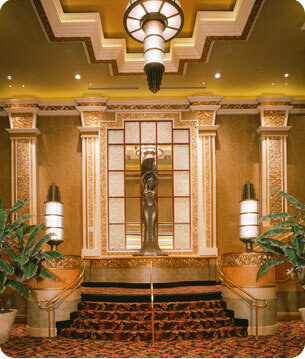 Pre-cast GFRG/GFRC products are provided to the hotel, casino, hospitality and retail venues. Collings Interiors initially manufactures a mold of the structure to be replicated from the designer’s drawing. After the mold is created and approved, a material such as gypsum or concrete, is poured into the mould and dries to form a casting, which is the permanent structure. The structure is then faux finished with a material that is comparable in appearance to gold, silver or marble, etc. GFRG/GFRC products provide a cost-effective and flexible alternative to solid marble, gold and silver structures.